Mandi Bird Kennerly says a prayer at the casket of Elouise Cobell on Friday evening during a viewing and rosary service at the Browning High School. Kennerly is a great niece by marriage to Cobell. Photo by KURT WILSON/Missoulian. BROWNING - They came from the Oglala Sioux Tribe in South Dakota, from the Navajo Nation in New Mexico and Arizona, from the Seminole Tribe in Florida. From across Indian Country, Native American people gathered Saturday on the Blackfeet Nation to honor Elouise Cobell, who fought the U.S. government to a standstill on their behalf. She died last Sunday, of cancer, at age 65. Cobell changed "the dark side of American history," said Dennis Gingold, an attorney who worked with her on the landmark Cobell v. Salazar class-action settlement that directs $3.4 billion to Indian people. Cobell died without ever seeing money reimbursed to an estimated half-million Native American people for royalty payments for the use of their land. The settlement, delayed by an appeal, also would fund college scholarships for Indian students and buy back land for tribes. By pursuing the case for nearly 16 years, Cobell demonstrated that "there are some things in life worth fighting for, whether or not they're considered hopeless, whether or not they're considered impossible," Gingold said. 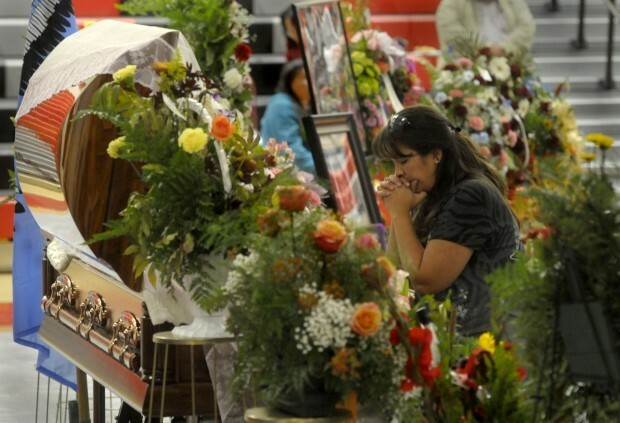 Saturday's funeral Mass for the woman known in Blackfeet as Inokesquetee saki - Yellowbird woman - drew nearly 500 people to the Browning High School gymnasium, where a star quilt served as an altar cloth and her casket rested on a buffalo hide. "Elouise is a hero in every sense of the word," said Larry Echo Hawk, U.S. Interior Department secretary for the Bureau of Indian Affairs. Among the other officials attending her funeral were Sens. Max Baucus and Jon Tester, Lt. Gov. John Bohlinger and Office of Public Instruction Director Denise Juneau, who grew up in Browning. Leaders from tribes around the country also attended, and the traditional star quilts and Pendleton blankets they brought as gifts hung on the walls and draped the railings of the gym. Edna Bowers came from Okeechobee, Fla., to say goodbye to someone she'd admired since reading a newspaper story about her more than a decade ago. "I said, ‘I've got to meet that woman,'" said Bowers, of the Seminole Tribe. "It was because of her drive. She went up the hill." "She opened a door so that many other would have a path," said Oglala Sioux Tribe Councilwoman Ruth Brown. Johnny Naize, speaker of the Navajo Nation Council, said nearly 40,000 Navajo people will benefit from Cobell's lawsuit. "This is the way to return our respect," he said. Also returning respect to Cobell were 38 members of the Birch Creek Hutterite Colony, located near the Cobell family's Blacktail Ranch south of Browning. "We put up their hay, we assembled their (irrigation) pivots, we helped them at calving," said Isaac Waldner. "We treasure our friendship." Cobell's financial acumen was obvious from a young age when she and her friend Zita Bremmer, who attended a one-room schoolhouse where students arrived by foot, on horseback or in wagons, would offer horseback rides to tourists in exchange for cookies. "When we grew up, we were going to buy a pink Cadillac and travel the country," Bremmer said. "We never did get the Cadillac but Elouise did get to travel the country." Years later, when Browning's only bank closed, Cobell started the Blackfeet National Bank and later co-founded the Denver-based Native American bank. First Interstate Bank Chief Executive Officer Jim Scott told mourners Saturday that a high-school "mini-bank" program started by Cobell now includes 1,200 students on reservations and more than $1 million in student savings. "She was a warrior and she was willing to pay any price to do the right thing," he said. Over the years, her tenacious fight was hailed by everyone from presidents to her own people, who bestowed upon her the rare honor of a warrior's eagle feather. Her work led to a "genius grant" from the John D. and Catherine T. MacArthur foundation, as well as numerous other awards and recognitions. Echo Hawk was supposed to be in Alaska this week, addressing the Alaska Federation of Natives and a Senate Indian Affairs Committee field hearing on suicide. But Interior Secretary Ken Salazar -named as the defendant in Cobell's lawsuit - diverted him to Browning. "This is the highest honor we can express," Echo Hawk said. "She was courageous. She was tenacious. She was a very strong person. She now goes down in history as one of the most significant Native American leaders in the United States." Salazar ordered flags at Interior Department offices to be flown at half-staff Monday in Cobell's honor, Echo Hawk said. "Not all defendants feel that way after a decade of litigation," said Echo Hawk, who brought formal letters of condolence to the Cobell family from Salazar and himself. A rotating photo show displayed on a big screen during the services showed Cobell posing with three different presidents - Barack Obama, George H.W. Bush and Jimmy Carter - as well as entertainers and actors like Conan O'Brien and David Hyde Pierce. The sly caption on one photo of Cobell posing with a movie star read, "DeNiro's a fan!" But the majority were of Cobell and various family members. "Elouise's World," read the caption on a photo of her son Turk and his family. "She was always the same person no matter who she was talking to," said Olive Gaitan, a cousin from Seattle. "She was not ever snooty." Gaitan said she last saw Cobell in August, months after a surgery at the Mayo Clinic in Rochester, Minn., had failed to eradicate her cancer. "She was pretty sick. She was quiet but alert," she said. And concerned, as always, about the progress of the lawsuit, its settlement delayed by appeals. In an interview with the Missoulian in June 2010, an exasperated Cobell said that "a lot of people have died waiting for this." At the time, she thought a mere Senate vote was the settlement's final hurdle. She was in Washington, D.C., to lobby for it. "And then," she said, "my work will be done." Her work remained unfinished at the time of her death. "You and I and our friends must complete what she started," Gingold said. "She saw the finish line but she could not cross it. Lend a hand. ... Justice requires it."